Microscopic examination of both platelets and megakaryocytes shows them to vary widely in size and ultrastructure. This structural diversity was noted by early investigators (Bunting 1909) and interest in its origin and significance has continued to the present day. While haemostasis is undoubtedly the major life-preserving function of platelets, several other functions have been attributed to them, such as phagocytosis, promotion of wound healing and IgE-dependent killing of schistosomes (Joseph et al. 1983). Platelets have also been implicated in inflammatory disease (Ginsberg 1981), atherosclerosis and thrombosis. There is little evidence at present that any of these functions are exclusively performed by distinct subsets of platelets analogous to the well-characterized subsets of the lymphocyte population. 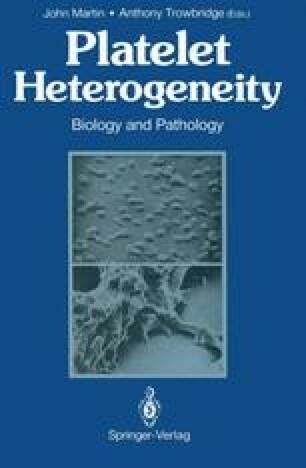 In general, platelet populations show continuous variation in structural or functional properties, although they are often divided up into arbitrary “subpopulations” for the purpose of analysis. While we must remain open to the possibility that categorically different types of platelets may exist, our main effort will continue to be directed towards understanding how this continuously variable platelet population arises and how it achieves its known functions.